Acyclovir sodium is an antimetabolite. It inhibits HSV-specified DNA polymerases and prevents further viral DNA synthesis without affecting the normal cellular processes. 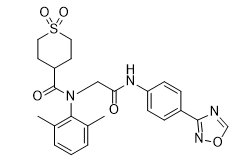 Amenamevir is a helicase-primase inhibitor which has potent antiviral activity against HSVs with an EC50 of 14 ng/mL. Acyclovir monophosphate is the monophosphate ester of Acyclovir. Acyclovir is an antiviral agent with activity against herpes simplex virus types 1 and 2 (HSV-1 and HSV-2) and varicella zoster virus. Acyclovir, a molecule tailored to inactivate the thymidine kinase of the herpesvirus, is a guanosine analogue antiviral drug. It is a drug for HSV infection by GlaxoSmithKline. Vidarabine is an antiviral drug which is active against herpes simplex and varicella zoster viruses. Ganciclovir is an antiviral drug for feline herpesvirus type-1 with IC50 of 5.2 μM.